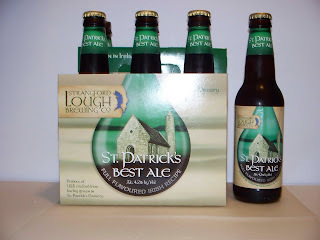 Beer Crusade: St. Patrick's Best Ale:Strangford Lough Brewing Co.
St. Patrick's Best Ale:Strangford Lough Brewing Co.
Well with today being St. Patrick's day, I thought it would be fitting to review a beer called St. Patrick's Best Ale. I've never heard of it before and just happen to stumble upon it in the beer store today, so I figured why the heck not. I must say I was blessed with the luck of the Irish. I was actually pleasantly surprised at how good this beer is. It's brewed by the Strangford Lough Brewing Company out of Northern Ireland, so you know it has to be at least half decent. It's a relatively new company, so you might not have heard of them yet. The beer poured a nice rich amber color with a healthy head which lasted throughout the entire glass. It's odor was mostly malty with a wee bit o' fruit thrown in there. I was really surprised with just how easily it went down. No bitter aftertaste, not overly carbonated, just a good drinkin' beer. I'd call it a very drinkable beer. Overall, I'm going to give it a solid 3. Nothing spectacular, just a respectable go to beer. And with a so-so 4.2%abv, it won't exactly knock your socks off, which isn't the worst thing ever. It basically allows you to have couple of pops and call it a night. If you're out and about and see it, I'd definitely recommend giving it a whirl.